I am much more of a salty person than I am a sweet tooth (take that as you will), but these caramels have the perfect balance of sweet to salty. The way I see it, why choose if you don’t have to? 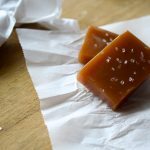 For an extra flavorful punch I like to add rosemary to these caramels. It gives this classic, decadent treat a revamp and creates great dimension of flavor. To be honest, when I first developed this recipe I didn’t use a thermometer at all. Of course that had to change as I was finalizing the recipe. Although, I have found that color indication and trusting the gut is one of the best ways to make caramel, or any candy for that matter. It’s kind of a thrill when there is just a small window of time that can make or break your caramel. I know, I like to live on the wild side. Lightly oil an 8×8-inch baking dish. Cut a piece of parchment paper to fit inside of the pan with a 1–2 inch over hang on two sides. Spray parchment paper with cooking spray, set aside. In a medium, heavy bottomed, saucepan combine water, corn syrup and sugar with a wooden spoon. Stir until all of the sugar is saturated with the water, set wooden spoon aside. Heat sugar solution over medium-high heat until the sugar begins to boil and temperature reaches 300° F, about 10 minutes. Reduce heat to medium and allow the solution to simmer until the edges of sugar solution are a light amber and temperature comes to 320°– 325°F, about 5 minutes. Make sure not to stir the sugar solution as it is boiling. Swirl the pan occasionally instead to prevent burning around edges of the pan. As the sugar solution heats to 300°F, bring butter, cream. and rosemary to boil. Off heat, add ¼ teaspoon sea salt and set aside. When the sugar solution comes to 320°F and the edges begin to take on an amber color, remove from heat and carefully pour a quarter of the cream and butter mixture into the sugar and swirl to incorporate. Be careful, the mixture will bubble up. Add the remaining cream and butter mixture and stir with a wooden spoon to incorporate. Return pan to heat and cook for an additional 5–10 minutes until the mixture comes to 240°F. Turn off the heat and pour caramel into prepared dish, allow the caramel to cool for 20 minutes at room temperature, sprinkle with sea salt and transfer to refrigerator for 1–2 hours until completely cooled and set. Pull the edges of the parchment paper to release caramel from pan. Cut into desired shape, I usually do 1½ x ½-inch rectangles. Wrap each individually in squares of parchment paper and enjoy. I hope you enjoy this sweet and salty treat! Recipe Note: If you want these to last for a while, keep them in the refrigerator and they will last for weeks. is cheaper and also works well.